Next week is SOCAP week: here’s what’s going on and where we’ll be all week. Tuesday (10/23) – Join us at a special reception. On Tuesday, the first day of the SOCAP Conference, join us at Fort Mason in San Francisco for Bridging the Bay Area, a special invite-only reception celebrating our work to bring to bear the transformative power of growth capital, and highlighting the partnerships that make it possible. This event will bring together a powerful group of investors, entrepreneurs, ICA Fund Good Jobs alumni, community leaders, and supporters of our work, who all believe in the power of capital to effect lasting change. The reception takes place at the Museo Italo Americano at Fort Mason and starts at 6PM. Click here to receive and invite and join us. Thank you to our lead reception sponsor, Kapor Center. Thursday (10/25) – Ingrid Jacobson talks Investing for Equity. On Thursday (October 25th) at 1130am Ingrid joins a powerhouse panel titled, "Investing in Local Enterprises for Racial Equity". Allen Woods, Nwamaka Agbo, Mariel Cedeno, Rodney Foxworth, and Ingrid will discuss how leaders are adopting multiple approaches to build and then reinvest wealth locally. The panelists will discuss replicable strategies that recognize the need and opportunities for sharing and redirecting capital to promote equity. Read more about the panel here, and be there Thursday. All Week – find us at the conference! 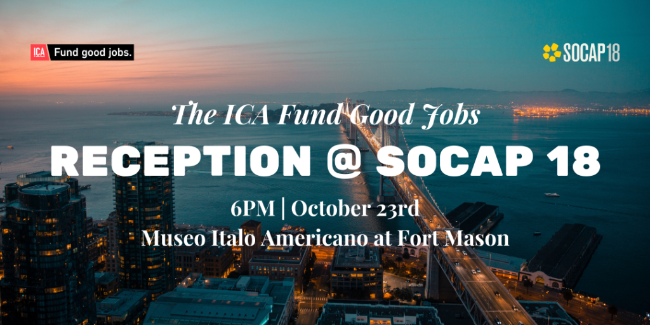 The ICA Fund Good Jobs team will be at SOCAP all week. You'll find us at our booths talking good jobs and entrepreneurship, and featuring some of our portfolio companies. You will also members of the team – including Sean, Ingrid, Kot, Valerie, and Rasheed – at different panels throughout the week. If you're already coming to SOCAP, stop by our booths (33 and 37). If you don't have tickets yet, it's not too late to register. Newer PostOur 2018 Impact Report is here!